Tuesday, when CBS News did a segment on the man who killed seven at a Sikh Temple in Wisconsin, one word was conspicuously absent: terrorist. All the pieces to make that judgment were in place: Wade Michael Page had a long history in white supremacist groups. (The album covers of his white-supremacist bands are pictured at the bottom of this article, where you can easily avoid looking at them.) His victims were non-Christian and non-white, and they gathered at a non-Christian temple. His massacre was violence against civilians, apparently for the political purpose of terrorizing the racial or religious groups they belong to. That’s terrorism. No white Christian terrorists. But the mainstream media doesn’t often call white Christians terrorists, and even if they express their motives in Christian or white-supremacist terms, you seldom run across the phrase “white Christian terrorist”. Almost by definition, terrorists are Muslims. And conversely, violent Muslims are terrorists. When someone does tie a terrorist act to Christianity, you can count on seeing a lot of pushback — articles begging for nuance, emphasizing how out of the Christian mainstream the terrorist’s views are, refusing to take seriously a childhood connection to Christianity, and instead demanding specific evidence of a religious motive (which hasn’t shown up yet in Page’s case). Again, these principles don’t apply when the killer has brown skin and a Muslim name. The white killer also gets portrayed with more sympathy. The CBS report includes pictures of Page as a cute boy, and shows his step-mother describing him as “kind and gentle and loving”. 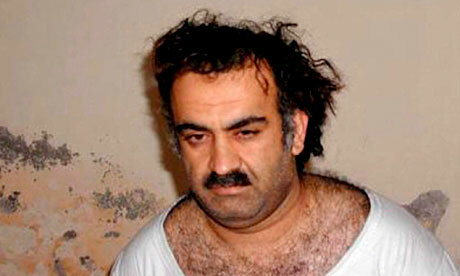 I’ll bet Khalid Sheik Mohammed was a cute child once, but this is the picture of him I’ve seen over and over. large numbers of potentially violent neo-Nazis, skinheads, and other white supremacists are now learning the art of warfare in the [U.S.] armed forces. The potential recruits were “a small percentage” of veterans, but a small percentage of a large number can still be disturbingly large. Page was precisely the kind of veteran the report was talking about. But it’s too late for the report’s author (Daryl Johnson) to get credit in DHS, because he’s long gone. The report raised a furor in the right-wing media, which interpreted it as a slander against both veterans and the rising Tea Party movement. It’s no small coincidence that Ms. Napolitano’s agency disseminated the assessment just a week before the nationwide April 15 Tax Day Tea Party protests. Her column ended: “We are all right-wing extremists now. Welcome to the club.” That message was echoed by Fox News and Republican leaders: Right-wing terrorism was something the Obama administration dreamed up to slander all conservatives. DHS responded to the furor by dissolving Johnson’s team, and Johnson himself left DHS a year after the report was published. What I think is going on. There is an underlying narrative in mainstream culture that People Like You are threatened by People Like Them. If a story fits neatly into that frame, then OK, go with it. Watching Oak Creek, that subset of Americans was put in a position to realize that a day prior they’d have identified with the terrorist more than his victims. And so they quickly looked away. Instead, we want to hear that the Threatening One is really not like us after all. He’s not a member of a group; he’s a loner. He’s not acting on beliefs that we share; he’s crazy. And his action is not a one-sided eruption of our hate onto their innocence; he’s a tortured soul who once had the potential for goodness; the suffering he inflicts arises from his own suffering. But the bully is always someone’s child. And no one wants to hear that. After reading this, I was thinking about people I know who would react negatively to this analysis and come up with any number of rationalizations for their bias. I realized that your piece is an appeal to intellectual honesty, and that these people really don’t care about intellectual honesty. Then I started asking myself why they don’t care, and ended up posing this question on their behalf, “Why should I care about intellectual honesty? What’s in it for me? How does it make my world better/safer?” and realized that they may actually need an answer to those questions. Maybe a subject for a post some day. That is a good topic that deserves a longer answer, but one aphorism I throw around is: “Reality is an acquired taste.” It’s like spicy food or coffee; the first time you get a blast of reality it’s like “Why does anybody like this?” But reality has an intricate beauty that no cartoon fantasy can match. One of my favorite ideas from a favorite novel*, is that lying is theft: when you lie to me, you steal my ability to make decisions based on reality. This is another idea to pursue if you do write on the value of intellectual honesty. As a non-rational, religious argument for honesty: the only people Jesus really spoke against were hypocrites. *”The Warhound and The World’s Pain” by Michael Moorcock. It’s out of print, but if any of you know Stephen Spielberg, tell him to make a movie of it. The real terrorist is the one who blow himself up to kill innocent people,The savage ideology makes them that way .DO NOT compere apples to rocks.Colorado,,Wis. events were event were crimes have with terrorism.The Arab who killed 23 soldier in Virginia is a terrorist. Actually, Major Hasan was not a terrorist. He attacked a military base. So he’s a traitor, but not a terrorist. One interesting idea. I dont believe it is right to hold anyone indefinitely without trial for any reason, but suppose a terrorist act is committed by a White Christian. Why is there no effort to move him to Gitmo or some other holding facility and pursue “advance interrogation” or whatever the administration moniker is for torture at this point in time? Is trial by jury only good enough for Whites?